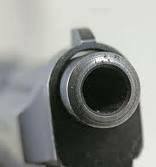 For the 67th instalment in Crime Watch's 9mm series, I thought I would bring you an interview with a relatively new-to-me New Zealand crime writer, Blair Polly. 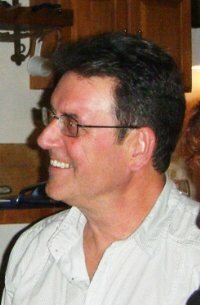 Polly was born in the United States, but moved to Wellington, New Zealand with his family as a teenager in 1970. He continues to live there today. His debut crime novel, BAD CHILLIES, centred on an abduction in Wellington, is now available on Amazon Kindle. You can read part of the first chapter of BAD CHILLIES on Polly's website here. He has also written another crime novel, ART, SHARKS, AND A COFFIN NAMED DENZEL, which is also available on Amazon Kindle, as well as songs and short stories. But for now, Blair Polly stares down the barrel of 9mm. Stieg Larsson’s Lisbeth Salander from the Millennium Trilogy has recently edged into first place from Michael Connelly’s Harry Bosch. Apart from reading things like Dr. Seuss and Winnie the Pooh as a child, the first book I read non-stop as a teenager was The Magus by John Fowles. I love it when a book grips me so tightly I can’t put it down until it’s finished. I started writing poetry and short stories in the late 1960’s. This was at the time of the Vietnam war, so many of them were anti-war and pondered the meaning of life and death. Most were absolutely terrible. About two years ago, I went through a stack of stuff from that era and spent the afternoon cringing and shredding old poems that I would have been too embarrassed for anyone else to find. A couple poems and stories survived, but 100’s didn’t make the cut. Not only do I want to make sure I’m wearing clean underwear when I get hit by that bus, I don’t want too much bad poetry lying around either. However, one ten-year-old short story I came across that day ended up giving me an idea that has since been expanded into my second novel. I’ve played guitar for as long as I can remember. Nearly four years ago a group of us started an original song workshop. Almost every Sunday afternoon since, a group of us meet up and play and work on songs different members have written. Well over a hundred songs have come out of various kitchens and lounges over the years, some better than others, but what a great time we’ve had creating new music. A few shots of tequila during our sessions seem to help too. Often while I’m out on my daily walk, I’ve got a song from the previous Sunday rattling around in my head. Sometimes it stays for a few hours, other times days. 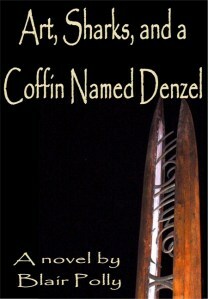 A couple of the songs I’ve written have had a part to play in my second novel Art, Sharks, and a Coffin Named Denzel. Having lived in Los Angeles until the age of sixteen, I relish every day I spend in Wellington. I think Wellington’s south coast is an inspiration every day of the year. Just catch the number 1 bus to Island Bay and start walking in either direction. You won’t be disappointed. I often get mistaken for George Clooney when I’m out and about. Just kidding, I should be so lucky. But seriously, I like George. Apart from being a fine actor, he’s got empathy and integrity in real life. I like to think I do too. I don’t have a huge catalogue to choose from, but my favourite has to be my recently completed second novel, Art, Sharks, and a Coffin Named Denzel mainly because many of the characters are creative. The book gave me a chance to explore the workings of creative minds, and my main character, Alex, could build all the sculptures I’ve dreamed of making myself for years, but in reality will never get around to building. While I was writing, l also fell in love with Lisa. Despite Lisa being fictional, she reminds me of lost loves and brought back many fond memories. My books are self-published on Amazon in kindle format so I’ve never had the chance to celebrate properly. However, the first time someone actually paid to download and read my book, I finally felt like a real writer for the first time. More than 1,500 readers have downloaded Bad Chillies since that time. Great interview! Look forward to reading some of Blair's work.